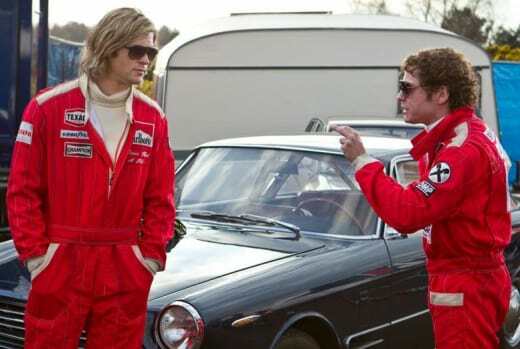 Rush is one thrilling ride of a movie that stars Chris Hemsworth as James Hunt and Daniel Bruhl as Niki Lauda, and it’s out now on DVD and Blu-Ray. Hunt and Lauda engaged in one of the sporting world’s most fierce rivalries as Formula 1 drivers staking their claim to be the best in the 1970s. Ron Howard directs in what is instantly one of his best films. Our theatrical Rush review found the film almost perfect -- from the thrills of the races and how Howard captured them to the performances of the leads, particularly Bruhl. The latter was honored with a Golden Globe nomination and was one of our Oscar nominations snubs and surprises as he was left off the list. The key to this film, as teased in the Rush trailer, is the true story behind the titanic tale centered on the uber-dangerous world of Formula 1 racing. As shown in that teaser, Lauda almost died from severe burns in a race against Hunt, and the most inspiring aspect of Rush is how he managed to come back to race again, merely months from knocking on death’s door. And when it comes to bonus features on the Rush DVD and Blu-Ray, they are as powerful and as interesting as the film itself. The Blu-Ray-only bonus features, for us, are highlighted by The Light of Speed and Filming F1. Oscar-winning cinematographer Anthony Dod Mantle shares his knowledge of how he filmed some of the most exquisite and exciting racing footage ever seen in the history of film. Mantle shows how he was able to put the audience in the driver’s seat to experience what Hunt and Lauda experienced, almost firsthand. 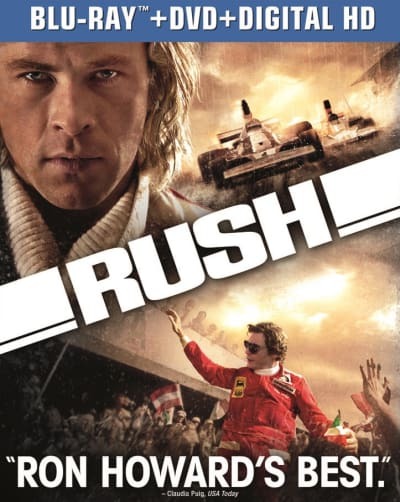 The Race for the Checkered Flag: The Making of Rush delves deep into Howard’s magic bag of tricks to show how this filmmaker who has crafted so much greatness, dug even deeper in making his latest. And although the visuals pop with excitement, the story wouldn’t be so powerful without the incredible words on the page of Peter Morgan’s script. The Oscar-nominated writer is profiled in Peter Morgan on Writing Rush and it is the rare, and supremely fascinating, look at how the words on the page make the leap to the big screen. Finding James and Niki puts the spotlight firmly on the actors, and Hemsworth and Bruhl talk about how they found the human element to men who have become legends and icons. Bruhl’s recollection of his private plane flight with Lauda is nothing short of priceless. In that vein, the feature Meeting James Hunt and Niki Lauda showcases real people who knew Hunt and know Lauda and how they feel that Howard’s film has captured their talents and personalities impeccably. Having this kind of insight after witnessing the magic of Rush only enhances the experience. A bonus feature that is available on both the DVD and Blu-Ray is not to be missed for Howard fans. Ron Howard: A Director’s Approach is the rare look at how the gifted filmmaker makes his movies. It is a documentary that explores not only Rush, but everything that Howard has pointed a camera at.